Stir together flour, sugar, baking powder, cinnamon, salt, and baking soda. Mix eggs, sour cream, and butter together in separate bowl. Add wet ingredients to dry mixture, along with the diced apples. Stir just until moistened. Fill greased muffin cups 2/3 full. 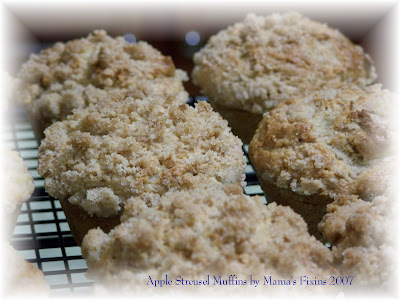 Combine the streusel topping ingredients and sprinkle on the tops of the muffins. Bake at 400 F for 20-25 minutes. yummy, this looks good!! I think I may have to try this! I got here from your other blog, love the blouse by the way...oh, and the button you have to click to this site, I almost was gonna use it (or one of the ones similar to it with the same lady) for the MTM blog. I just thought that was funny bcz I've never seen it except for @ istock.